Like the Usher syndrome community we represent, the Usher Syndrome Coalition continues to grow in size and influence. The community and Coalition often feel like they are one and the same. Since our last newsletter in November we have added scholarships to the family conference to ensure everyone has an opportunity to attend, partnered with the Stephen A. Wynn Institute for Vision Research to provideaccess to genetic testing for everyone with Usher syndrome, and were nominated for a Classy award for excellence in philanthropy. All this as our registry, family network, and advocacy efforts continue to expand. In just the past few months, we’ve done a lot. Yet I’m here to tell you this is just the beginning, both for the Coalition and the community. There are more great programs coming that will expand your access to information about Usher syndrome research while increasing the pace of that research. So watch out for coming announcements. And, as always, thank you. We couldn’t do any of it with your help and support. Ask your representative to sign on to support the inclusion of Usher syndrome report language. For those in the US, the deadline to have your Member of Congress sign the Dear Colleague Letter is TOMORROW, close of business Tuesday, March 22nd. Congresswoman Niki Tsongas is leading this letter to the House Committee on Appropriations, which is being circulated on Capitol Hill. The letter urges representatives to join the Congresswoman in supporting research regarding the treatment of Usher syndrome at the National Institutes of Health (NIH) by signing on to the letter by close of business Tuesday, March 22nd. Thank you to all who have contacted their Members of Congress so far. We encourage you to reach out to your representatives again to urge them to sign on to this Dear Colleague letter supporting Usher syndrome report language. It's important that your representative hears from you today. As evidenced by our past advocacy efforts, when you speak, they listen. Click here to find your representative by zip code. Once you've located your representative, you'll be able to click through to a "Contact" page where you can send him or her your personalized message. My name is [NAME] and I [HAVE USHER SYNDROME/HAVE A FAMILY MEMBER OR FRIEND WITH USHER SYNDROME/AM A RESEARCHER WORKING ON USHER SYNDROME]. Usher syndrome is the most common genetic cause of combined deafness and blindness. It impacts nearly 50,000 Americans. Those with Usher syndrome and their families demonstrate courage every day in overcoming the challenges they face. I urge you to support research regarding the treatment of Usher syndrome at the National Institutes of Health (NIH) by signing the Dear Colleague letter to the House Committee on Appropriations in circulation today. Led by Congresswoman Tsongas, this letter supports the inclusion of report language directing the NIH to prioritize Usher syndrome research at the National Eye Institute (NEI) and the National Institute on Deafness and Other Communication Disorders (NIDCD). The deadline to sign on is COB Tuesday, March 22, 2016. We hope we can count on your support and we look forward to working together in order to eradicate this disease for current and future generations. Email your House Representative now. Read Mark's latest blog for a summary of our recent activities in Washington, DC. Unraveling USH is a collaborative effort between the Usher Syndrome Coalition and the Stephen A. Wynn Institute for Vision Research at the University of Iowa to ensure everyone with Usher syndrome has access to genetic testing. Unraveling USH seeks to provide guidance and affordable testing to people who have been unable to get genetic testing in the past, either due to lack of access or financial barriers. This initiative will help to fulfill the Usher Syndrome Coalition's goal to identify everyone with Usher syndrome worldwide, while offering state-of-the-art genetic testing through the John and Marcia Carver Nonprofit Genetic Testing Laboratory at the University of Iowa. Learn more about how to participate and visit our Q&A page to learn about the importance of genetic testing and other frequently asked questions. The Registry aligns over 1000 registrants from 50 countries with the latest advances in research and treatment. The Registry is available in Dutch, Spanish, Hebrew and English, with more translations in the works. In MediaPlanet's latest Vision & Hearing campaign, Nancy O'Donnell, director of the International Usher Syndrome Registry, reminds us of the importance of being recognized as someone with - or a parent of a child with - Usher syndrome. Of the 400,000 people worldwide living with Usher syndrome, the research community is in touch with less than 1%. We aim to change that. Registering is simple and confidential, and involves no commitment or promise to do anything except to be recognized as a person with Usher syndrome. The Usher Syndrome Coalition team looks forward to linking you to the latest information and opportunities to participate in studies and surveys. Join today: www.usher-registry.org. You can learn more about Nancy in her blog post, Calling all Experts, also available as a signed vlog on our YouTube channel. The Family Network links over 300 families from dozens of countries. 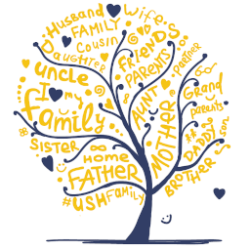 The goal of the family network is to connect Usher individuals and families. Many families join the Family Network for their own benefit. They want to talk to someone with similar experiences. They want information. They want help. But in the process of communicating with other Usher families, they end up providing precisely what they are seeking. You can join the Family Network here. The Usher Syndrome Coalition presents the 8th Annual Usher Syndrome Family Conference, to be held on Saturday, July 9, 2016 at the Washington Athletic Club in downtown Seattle. Join us for this annual gathering, a place for individuals with Usher syndrome, family members, friends and professionals to learn about the latest advances in Usher syndrome research. The event's science sessions, family panel, research Q&A, lengthy breaks and evening social allow for the opportunity to connect with others impacted by Usher syndrome and engage with researchers who are working tirelessly towards a cure. To view a general announcement and registration information in ASL, click the YouTube videos below. 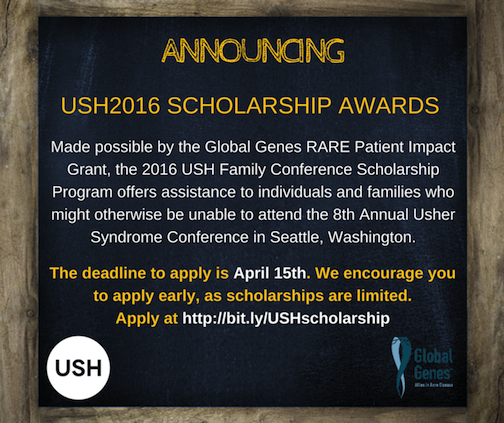 We are proud to announce the 2016 USH Family Conference Scholarship Program, made possible by the Global Genes RARE Patient Impact Grant. The creation of the USH Family Conference Scholarship Program will enable individuals with Usher syndrome and their families to attend the 8th Annual Usher Syndrome Family Conference in Seattle, Washington on July 9, 2016. Scholarships are based on financial need and will assist families or individuals who would otherwise be unable to attend. Applying for a scholarship is easy. Deadline to apply is April 15th. Download the 2016 Usher Syndrome Family Conference Scholarship Application. The Usher Syndrome Coalition's global campaign to Own the Equinox for Usher Syndrome Awareness has been nominated for a Classy Award. The Classy’s have been likened to the “Oscars for philanthropy.” The global campaign to Own the Equinox has been nominated because it addresses a social problem using an innovative approach. It speaks to the increased rates of social isolation within the Usher community. As the only organization in the world seeking to identify and support every person living with Usher syndrome, the campaign demonstrates how this unprecedented global movement empowers participants, fostering emotional well-being and engagement. The 100 finalists will be announced in April and the Classy Awards will be presented on June 16, 2016 in Boston, Massachusetts. Be sure to help us Own the Equinox again this August, leading up to the second annual Usher Syndrome Awareness Day on Saturday, September 17, 2016. You are welcome to take advantage of any and all of these resources. The United States Department of Justice operates a toll-free Americans with Disabilities Act (ADA) Information Line to provide information and materials to the public about the requirements of the ADA. If you'd like assistance understanding how the ADA applies to your situation, ADA Specialists are available Monday through Wednesday and Friday from 9:30 AM to 5:30 PM.